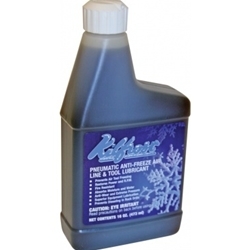 Kilfrost Pneumatic Tool Anti-Freeze Lubricant BOWESHO Killfrost. It prevents the freezing of pneumatic equipment caused by the formation of ice in and around exhaust ports and valves. Kilfrost® absorbs the water in the airline. Is a semi-synthetic lubricant which has none of the drawbacks associated with normal oils.